Paper: Taylor, J.R.A., Gilleard J.M., Allen, M.C., Deheyn, D.D. (2015)., Effects of CO2 –induced pH reduction on the exoskeleton structure and biophotonic properties of the shrimp Lysmata californica. Nature Scientific Reports. 5:10608. DOI: 10.1038/srep10608. Figure 1: Red Rock Shrimp (Lysmata Californica). Credit: D.D.Deheyn and M.C.Allen. Crustaceans not only depend on the strength and colour of their exoskeletons for survival, but for some, such as the red rock shrimp (Lysmata californica), being transparent also gives them an added camouflage advantage amid their rocky habitats. All is not well in terms of ocean chemistry though. Ocean acidification is a process where some carbon dioxide in the atmosphere (including carbon dioxide released from burning fossil fuels) is being absorbed by the ocean, lowering its pH and making it more acidic. Its effects on marine organisms are complex, but much attention has been given to hard-shelled animals that make their coverings out of calcium carbonate. Just like soda–an acid, is to teeth–calcium compound, an acidifying ocean means calcifying organisms such as oysters and clams, may face dissolution and will have a harder time building their shells, leaving less energy for feeding and reproducing. Shrimp are generally thought to be less vulnerable to changing ocean chemistry because they can internally control calcification, regulate pH and use different building blocks for their shells that other marine calcifiers do not. 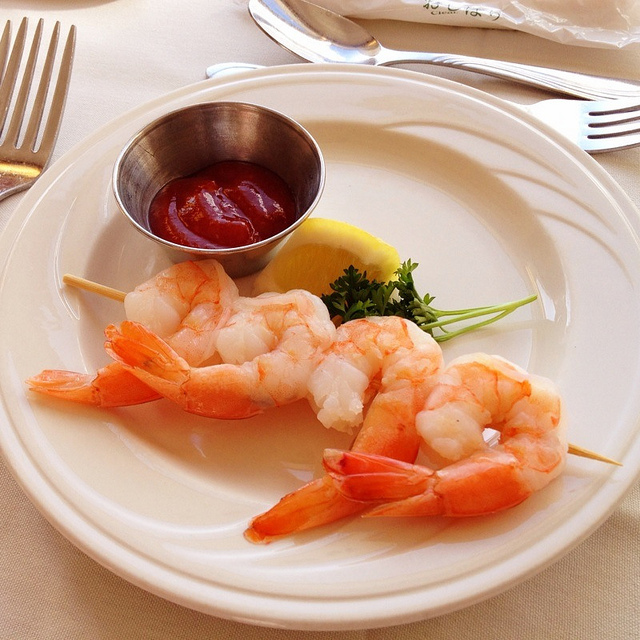 However, due to their commercial importance and significant role in food chains, shrimp should be studied in regards to ocean acidification so any findings can be included in management plans. 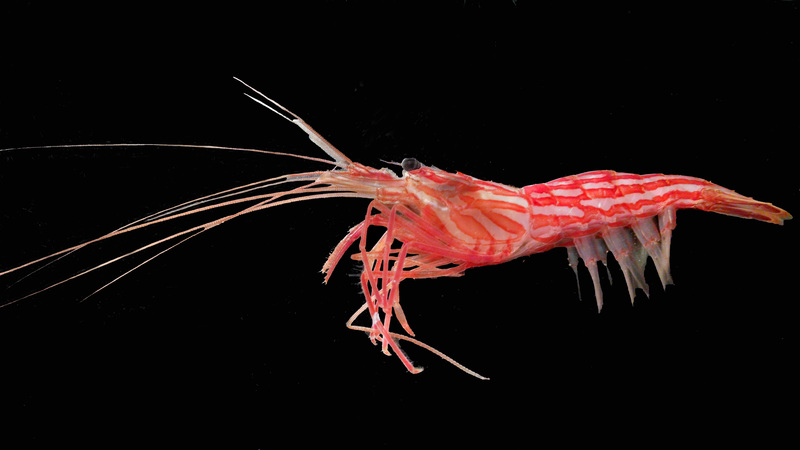 Taylor, JRA et al., completed a short-term study on a common red rock shrimp to predict how an acidifying ocean might impact the function (thickness, transparency and colouration) of its exoskeleton. Twenty-four red rock shrimp were collected off the coast of San Diego, CA and brought to Scripps Institution of Oceanography where they were placed in individual tanks. One tank system served as a control and was kept at the pH of the collection area 7.99 (±0.04). The pH of the treatment tank was slowly lowered over five days to 7.53 (±0.06) and kept there for 21 days. The shrimp were then anesthetized and euthanized. To test exoskeleton thickness, the carapace (upper body) of the shrimp was removed, and any attached flesh was scraped off with a paintbrush. The exoskeleton was then ‘freeze fractured’ with liquid nitrogen so a clean break resulted, making it easier to analyze the cross-section. The structure, thickness and relative calcium content was then measured using a scanning electron microscope and an x-ray analysis system. Three shrimp from both the control and treatment tank were also tested before and after the experiment using an imaging system that measured both transparency and colour. Figure 2: Top – exoskeleton cross section of control (left) and reduced pH treatment (right). Bottom: Mineral maps of calcium for control (left) and reduced pH treatment (right). Edited from Taylor, J.R.A., Gilleard J.M., Allen, M.C., Deheyn, D.D. (2015). Overall, results showed that even a relatively short-term exposure to higher-than-normal acidic conditions has measurable impacts on red rock shrimp. 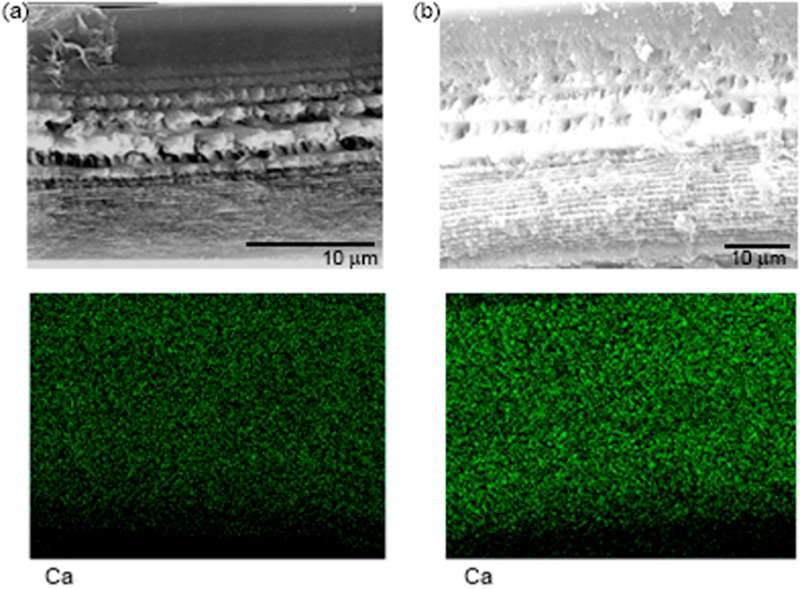 While the thickness or structure of the exoskeleton was not significantly different across treatments, the relative amount of calcium was two times higher in shrimp exposed to increased acidic conditions! (18% by mass for control versus 36% by mass of higher pH treatment–see Figure 2). This increase in calcium means that the shrimp exoskeleton is heavier, less flexible and also more brittle which can ultimately impact movement. For example, the exoskeleton may be more prone to facture during predator defense, or when engaging in a sudden escape response (i.e. tail flipping). 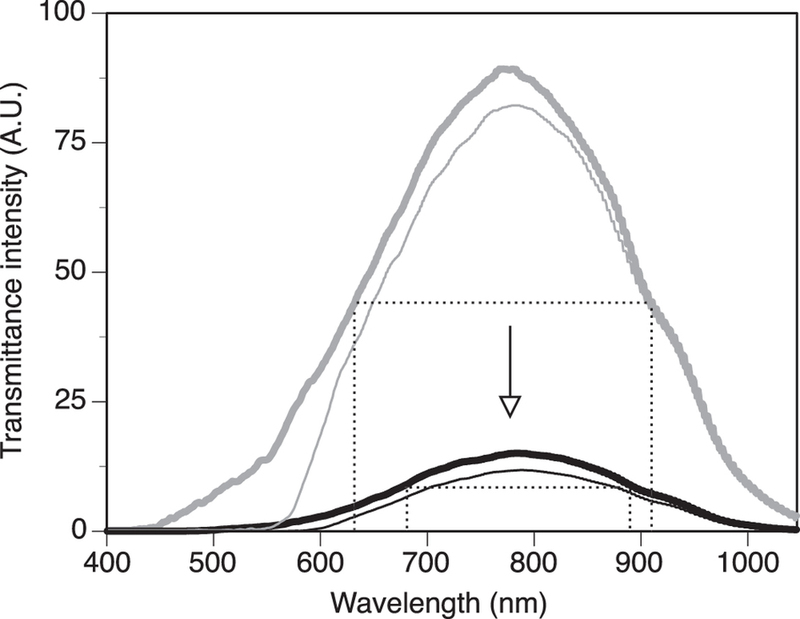 Figure 3: Transparency measured via ‘transmittance intensity’ of different wavelengths. Grey line represents control treatment and black line represents low-pH treatment. Dotted lines indicate half of the maximum peak and the arrow, shows the relationship between the two treatments. Taken from: Taylor, J.R.A., Gilleard J.M., Allen, M.C., Deheyn, D.D. (2015). As for transparency, the shrimp that were exposed to higher acidic conditions were five to seven times less transparent–a drastic change for a short term experiment! (see Figure 3). Keep in mind that the entire shrimp, including the flesh was measured for transparency, so it may not be solely due to the higher calcium mineral content found in the exoskeleton. Interestingly the red colouration was not significantly different across the control and treatment conditions which may be due to the shrimp’s ability to modify pigments in response to changes in pH. This study provided another glimpse into the complexity of ocean acidification and what it means for marine organisms. For shrimp, short term exposure could mean heavier, but brittle exoskeletons and decreased transparency. Further studies could include longer-term experiments to compare biological, physiological and mechanical consequences as well as ecological implications. Why should we care anyway? Well there is a good chance that these results may hold true for other types of shrimp–including ones we eat. Shrimp is America’s favourite seafood, and if we want shrimp cocktail, tempura or tacos around, we best be acting on curbing carbon emissions ASAP. *mic drop. We want to hear from you: What other marine animals are affected by ocean acidification in surprising ways?